Bottle gourd is also known as lauki, ghiya, dudhi in india. Bottle gourd has to be one of the healthiest of vegetables and I think it is not so favorite amongst many, When I was sick my friend A one day she prepared bottle gourd soup for me and the result was an amazing, thick, rich, creamy and nutritious soup. She shared the recipe with me and I made the soup couple of times. I want to share this as most of us do not like bottle gourd and that includes me too. This soupwill change that for folks who do not like bottle gourd as it has done for me. I love bottle gourd in this form. It also excellent for children and old people as bottle gourd has a lot of health benefits. Bottle gourd soup is great for those who are either on diet or wants to lower their cholesterol. It is good to be served to those who have diabetics in their home. 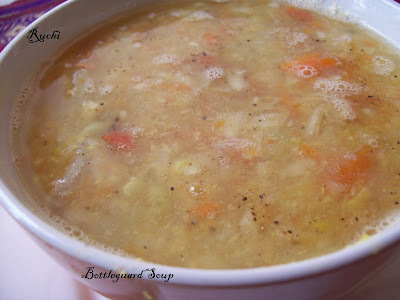 You can have this soup in mid morning or in the evening with a brown bread .It will make you feel full because it contains lot of fiber and water and hence helps to curb hunger pangs. Health Benefits: Bottle gourd is low in fat and cholesterol yet high in dietary fibre. It contains 96% water, which makes it very cooling and easy to digest. It is rich in iron, vitamin C & B complex, has sodium and potassium. It is excellent for light and low-cal diets and effective against constipation and other digestive disorders. Lauki(Bottle gourd) - ½ peeled and cut into medium size pieces, can remove the inner seeds if hard. Any vegetable - 1 cup, cut into small pieces. 1.Rinse the bottle gourd in enough water and peel it. 2.Chop the bottle gourd , onions and garlic and put it in a pan. 5.Now let the veggies and stock cool; in a blender or food processor blend the veggies. But keep the stock aside. 6.In another pan now heat the oil And lightly fry onion, garlic dalchini, tejpatta Sauté for 2 minutes . 7.Then add the pureed bottle gourd, veggies, dal then add the veggies stock to get the consistency you want and boil in simmer for 5-6 mins. 8.Before you switch off the fire add the cream cheese( optional). 1. i think adding milk to this will reduce its health quotient and increse its cholestrol. dont u think so? 2. i m confused about stock. what is stock? 4. how to cook bottle guord, i mean, u've written cook bottle guord in a pan, does it mean we need to bring it to a boil - wont it consume much gas, can i pressure cook it ? first you have boiled lentils and bottle guard keep aside. finally you have to add cooked dal, purified bottle-guard then add milk.Adding 1 cup milk never reduce health quotient. otherwise you can add skimmed milk.